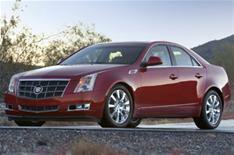 Cadillac CTS to cost from 26,995 | What Car? The all-new Cadillac CTS executive car will cost from 26,995, and potential buyers can see it for the first time at the British Motor Show. The car, on sale in September, is powered by either a 207bhp 2.8-litre V6 petrol engine or a 305bhp 3.6-litre V6 petrol. Both models come with a six-speed automatic gearbox, with the larger-engined car also getting gearshift paddles behind the steering wheel. A 2.9-litre V6 diesel engine will be added to the range next year. The rear-wheel-drive car also comes with traction control and a limited-slip differential as standard. There is only one trim level, called Sport Luxury. Features include rear parking sensors, automatic wipers, heated leather front seats, climate control, cruise control and a 10-speaker Bose stereo with iPod connectivity.